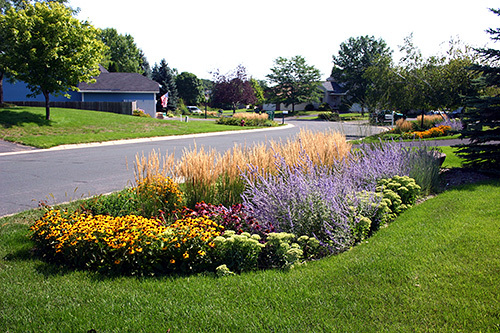 Rain gardens are designed to capture rainwater that runs off impervious surfaces, like driveways and lawns, to prevent it from entering the street, where it would pick up pollutants and heat on its way to our streams. The rainfall waters the plants in the garden, then slowly filters into the ground where it replenishes our depleting aquifers. Rain gardens not only aid in stormwater management and keeping our water supply clean, but also beautify our neighborhoods and provide habitat & food sources for birds, butterflies and beneficial insects. Many cities across the U.S. have combined sewer systems, where stormwater overburdens our water treatment plants and leads to overflows of raw sewage into our waterways. So, rain gardens and others methods to capture and/or slow down stormwater are sorely needed! Be sure to include plants that can tolerate both wet and dry conditions, as a rain garden should not have standing water for more than a couple of days. Native plants are the best choices since they will require little maintenance.